Participating in a sport as a diabetic takes some planning. The following tips should help diabetics get ready to play sport, whether they are children or adults. Before participating in sport or exercise, diabetics should make their doctors aware of their intentions and take notice of any advice. Testing yourself is crucial. Diabetics taking part in sport should be able to test themselves and take advice from their doctor on when to test blood sugar levels. 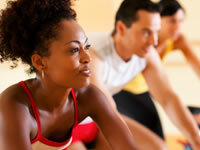 Diabetics participating in sport may have to test before, during and after exercise. This is also known as self-monitoring. Secure your insulin pump. Before playing sport, make sure that your insulin pump will not be disturbed by the activity. If you can’t play a sport because of your insulin pump, consult your doctor. Choose your food carefully. Your doctor will also be able to tell you what to eat as a diabetic taking part in sport. For instance, you may need extra snack food before, during or after playing sport. Make sure you carry snacks and water with you, wherever you are exercising. Take sufficient testing equipment, medication, emergency contact information. Choose your injection site wisely if you are planning to exercise. Don’t administer insulin to a part of the body about to be actively used in sport, as this can speed up the blood glucose lowering effect of the injection. Tell people. Don’t exercise with people that don’t know you are diabetic. There is nothing to be ashamed of, so don’t hide it, particularly from teachers or sports coaches. Tell people you have diabetes. Be prepared to stop. Quitting in sport is not usually encouraged, but with diabetes you have to be prepared to stop when your body’s telling you to. In some cases this may be just long enough to drink water, eat a snack or test blood sugar levels. Diabetes experts indicate that no matter how closely children and parents stick to diabetes sporting advice from doctors, at some point children are likely to experience low blood sugar. Take advice. As a parent, make sure you take advice from a doctor or diabetic health care team before allowing your child to take part in sport. These experts should be able to provide you with clear advice about taking part in sport. Be prepared to make testing/medication changes. It may be likely that your child will need to vary their testing regime, or insulin/medication dosage. Adjust meals and snacks. For children in particular, being a diabetic and taking part in sport may need adjustment to meals and snacks. The diabetic health care team should be able to recommend suitable snacks and advice on when they should be eaten. Take snacks and water. Wherever your child is taking part in sport, make sure that they have snacks and water close to hand. Make sure that all equipment is packed. If your diabetic child is going away to play sport, make sure all of his or her equipment is packed. Tell teachers and coaches. Both teachers and coaches should know that your child is diabetic, and understand what this means, including how with high or low blood sugar levels, should they occur. Encourage your child. Taking part in sport is good both mentally and physically. If your child can stay fit and healthy, whilst still keeping a tight control on blood sugar levels, in the long run it will benefit his or her diabetes and overall health. All diabetic children participating in sport should carry some type of medical identification which details diabetic treatments and provides contact details in event of emergency.